Free internet free breakfast and free parking plus state-of-the-art amenities and a great price await our guests at La Quinta Inn & Suites Bozeman. This 56-room all non-smoking hotel on three floors offers free high-speed internet flat-panel TVs microwaves refrigerators free local calling and free morning newspapers. The hotel provides a hot and cold expanded continental breakfast to get your day started and the business center provides copy print and fax services. After a day of touring skiing or working the indoor heated pool hot tub and fitness center are just where you want to be for relaxation and staying in shape. There's an on-site laundry facility. Parking is free and pets are allowed with some restrictions. 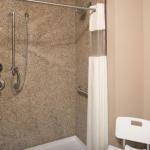 The hotel is less than two miles from downtown Bozeman with its shops restaurants and modern western ambiance. The Museum of the Rockies is 10 minutes away as is Montana State University-Bozeman. Yellowstone National Park is less than 90 minutes from the hotel. Gallatin Field Airport is nine miles away.